What Would The Founding Fathers Drive? With the 4th of July approaching we remember our founding fathers and their unlikely victory against the British. A victory achieved without automobiles. But what if they were around today? What would the founding fathers drive? Clearly, the answer is a the AMC/Renault Alliance. The Americans would not have gotten far without help from the French and neither would have AMC. 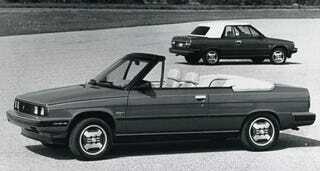 Designed by Renault but built and restyled in America, the Alliance was the 1983 Motor Trend Car Of The Year. It allowed American Motors to hang on long enough to be sold to Chrysler when the company was under stress after the assassination of Renault president Georges Besse (the second Louisiana Purchase). Of course, the company has now been sold to FIAT so... you all better learn to speak Italian. Pronto!